A few hours ago, I had my exam in functional analysis. This should be the last exam for the semester. Now I should have more time for my projects. Currently on my radar: a startup, diStorm, and maybe a website. Of course, I expect the startup to eat a lot of my time. For now I’ll just have to see how it goes. On another subject, I wanted to show instructions for the origrami lottery-spider. 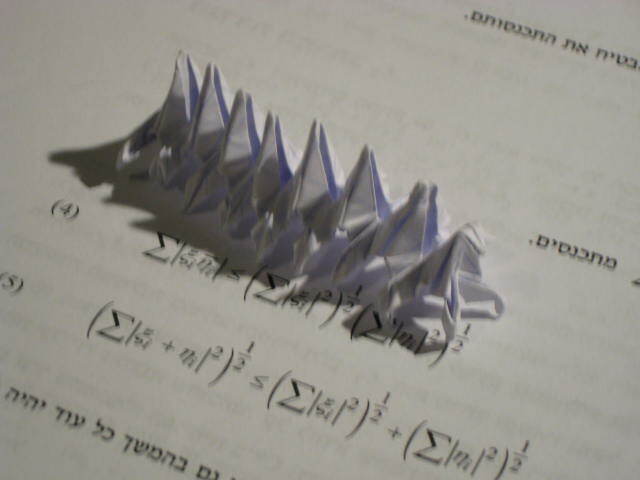 It turns out that this fold is modular in the sense that a piece of 1:n paper generates a critter with n+1 pairs of legs. This entry was posted in Origami, Personal and tagged Origami, origami caterpillar, origami spider, Personal, plans, Projects. Bookmark the permalink.